Here’s the review of The Hunger Games I wrote for Goodreads, giving a score of 4 out of 5 stars (really liked it). Much better than I anticipated. It’s definitely meant to be entertaining—don’t go into this expecting lofty literature. The Hunger Games isn’t very literary, but there are certainly some beautiful moments in the prose. This isn’t Collins’ first rodeo—she knows what she’s doing and knows how to use the 3-act structure to her advantage. Without going into any spoilers, I can tell you that Collins tries to give her readers what they want. I was caught off guard by the romantic elements thrown in there, but the teenage girl in me did enjoy it. Sort of the same way I find myself tapping my foot to the soundtrack ofHigh School Musical. Don’t judge. Other reviews made me think this would be much more psychological than I found it to be. I didn’t think it was nearly as disturbing as Lord of the Flies, and I don’t think the themes in Hunger Games are as deep (or perhaps as contrived). As far as dystopian books go, I was completely bored by 1984, so I’m probably not the person to ask. My husband and I read this together. He said it was “definitely written by a woman” because she focused on how the character felt. Well, that just means the protagonist is female and acts like one. But don’t make the mistake of thinking that because this book has a female protagonist, it’s going to be chick lit. Yes, there’s some romance thrown in there, but I can thankfully say there is not one mention of menstruation, which I am SO sick of hearing female protagonists talk about. It’s not going to win any Pulitzers, but I think time will remember this novel. I’ve really got to hand it to Collins, she gives me hope for the future of women writers and female protagonists. I might actually start reading more books with female characters again. I might even be so bold to start writing with female characters. You’ll want to see the movie before reading the novel if you don’t want to be let down by the film, but that’s pretty much par for any novel-to-film adaptation. Since the novel is written in first person, present tense, the relationship between the reader and narrator/protagonist is extremely intimate. You hear Katniss’ thoughts in real time. In the movie, they rely on the commentators of the games, a shaky camera, and a whole lot of “shifty eyes” in an attempt to show what she is thinking. This is the case where a strict adherence to “show, don’t tell” really doesn’t work. Sure, soliloquies might be a bit antiquated, but I would have at least liked to hear a couple more lines from Katniss, and DEFINITELY more from Peeta, since he’s got all the best lines in the book. The Hunger Games: Analysis to come! thanks for the review. I haven’t read the books or seen the movie yet, but I have read SC’s fabulous middle grade series, Gregor the Overlander. She is definitely one of the best dystopian fantasy writers for kids of our time. I’m thrilled to see her make the jump into the adult audience with this series. My husband, grown sons and I have all enjoyed The Ranger’s Apprentice series by John Flanagan, another YA series that made the jump to adult audiences without a hitch. 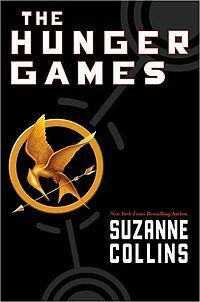 I’d highly recommend it to readers who loved the Hunger Games. And, I might add, the male readers may enjoy it more. While it has one strong female protagonist, the other two are male. Per your recommendation, I may watch the movie first, and then picture the actors as I read the books. That worked beautifully for me with The Girl With the Pearl Earring. I was able to see the book in technicolor, thanks to the movie. Thanks for the comment and your recommendations! I’d prefer reading the book first so I can visualize the characters and scenes myself, but then wait a while before I watch the movie. A fresh movie is more comparable to a stale book than one still sizzling in your mind. I’m determined to like The Hobbit movies, so I’m not allowing myself to reread the books until I see them. We watched the Harry Potter movies immediately after reading the books for the first five, and the movies always disappointed. For The Half-Blood Prince, we saw the movie and then started reading, and we loved the movie and are enjoying the book. We’ve yet to decide how we will order the movies and novel of Deathly Hallows, though. I prefer being surprised by a book than a movie. I’m inclined to blast through book 7 and then wait a few months (or weeks, more likely) to watch the movies. As for The Hunger Games books 2 and 3, I’ll read those soon and then watch the movies when they come out.